For as many days that we have seen snow in the Twin Cities this November - 7 days out of the first 11 of the month - we have only picked up 1.6" of snow. Meanwhile, a quick hour or so up I-94 in St. Cloud 5.1" of snow has fallen. 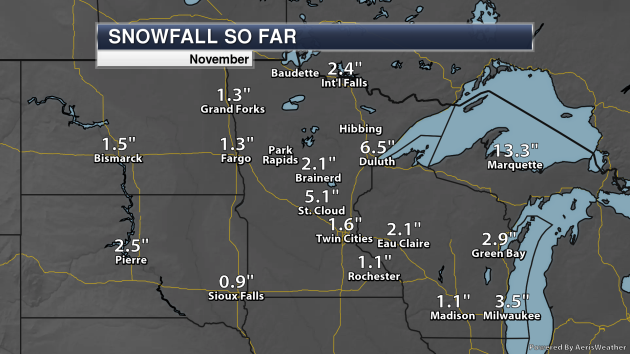 We've also seen 6.5" of snow in Duluth, with three days seeing over an inch of snow. We are slightly below average here in the Twin Cities for snow so far this month, but both St. Cloud and Duluth are about 3" above average. 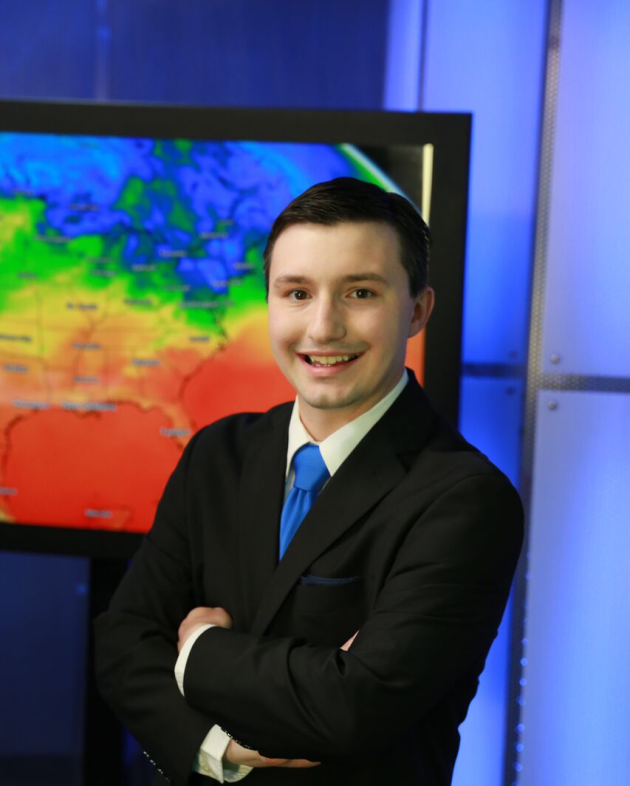 How Much Does Snow Cover Impact Temperature? As we enter into the time of year when we start seeing almost consistent snowpack, it is interesting to take a look and see how much that actually does impact our temperatures. This chart, courtesy of the Iowa Environmental Mesonet, shows what our average high and average low per winter month is with or without snow cover. 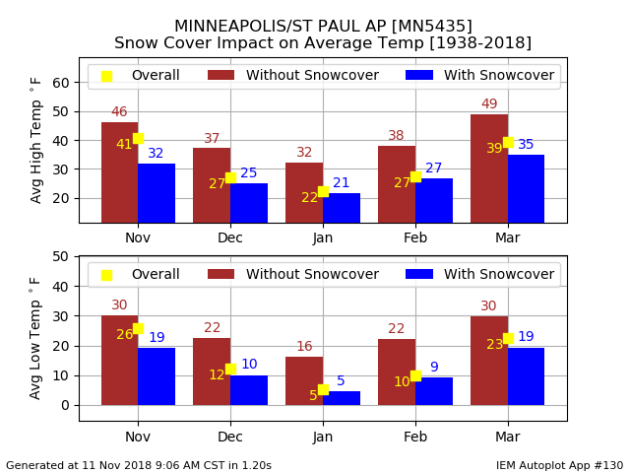 During November, our average high can be 14F degrees cooler when we have snow cover on the ground (an average high of 46F without snow cover and 32F with snow cover). This type of impact, though at a slightly lesser temperature difference, occurs from December through February as well. So if you want warmer temperatures during the winter... you're probably hoping there isn't snow on the ground. A Climate Thumbprint for California's Wildfires? I thought I was immune to shock, until I saw some of the stories, videos and photos from apocalyptic fires in California. Did climate change trigger the blazes? No. Did a consistently warmer, drier climate in the western USA make fires that would have formed naturally bigger, hotter - lasting longer? The answer to that one is yes. There are other factors in play: more homes in high-risk areas and demographic shifts, but 4 of the 5 biggest fires in California history occurred in the past 6 years. The eastern USA is trending wetter (more fuel for severe flooding) - while the west is drier and hotter, creating more super-sized wildfires. There is nothing scientifically controversial about that statement. Chances are you're ready for a thaw, and it's coming. The sun removes some of the sting today, and 40s will feel like a meteorological epiphany tomorrow and Thursday. The next clipper may deposit a coating of slush Friday night, but another wave of mild, Pacific air pushes into Minnesota next week. ECMWF hints at 40s, with light rain or drizzle on Thanksgiving. TUESDAY: Partly sunny, chilly. High 28. Low 18. Chance of precipitation 0%. Wind SW 7-12 mph. WEDNESDAY: Blue sky, a welcome thaw. High 43. Low 30. Chance of precipitation 10%. Wind S 10-15 mph. THURSDAY: Peel off a layer or 2. "Milder". High 45. Low 29. Chance of precipitation 10%. Wind W 8-13 mph. FRIDAY: Cooler, period of slushy snow late? High 38. Low 19. Chance of precipitation 60%. Wind NW 8-13 mph. SATURDAY: Early flakes, then clearing & colder. High 28. Low 13. Chance of precipitation 30%. Wind NW 8-13 mph. SUNDAY: Sunny, thawing out again PM hours. High 35. Low 27. Chance of precipitation 10%. Wind SW 10-20 mph. MONDAY: Flurries or drizzle. Gray skies. High 37. Low 26. Chance of precipitation 30%. Wind NW 7-12 mph. 1986: Lakes are frozen over throughout much of the state, reaching as far south as Winona. 1938: A snowstorm develops across northern Minnesota. The barometer falls to 29.31 inches in Duluth. 1933: The first Great Dust Bowl Storm occurs. The sky darkened from Minnesota and Wisconsin to New York State. 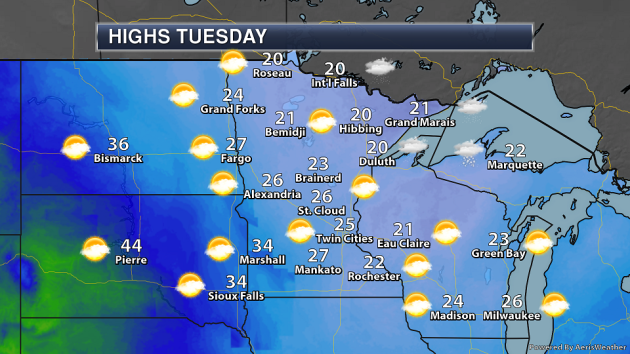 Temperatures will climb a little bit on Tuesday with some 30s making an appearance in southwest Minnesota. The rest of us will be stuck in the 20s once again. Mostly sunny skies are expected for most locations, but a few flurries will be possible across northeastern Minnesota. 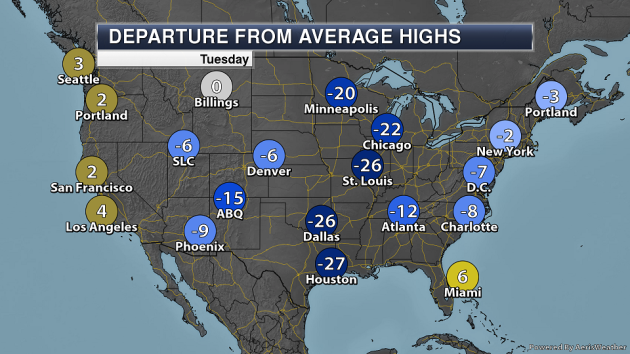 In most areas, highs will once again be 15-25 degrees below average. 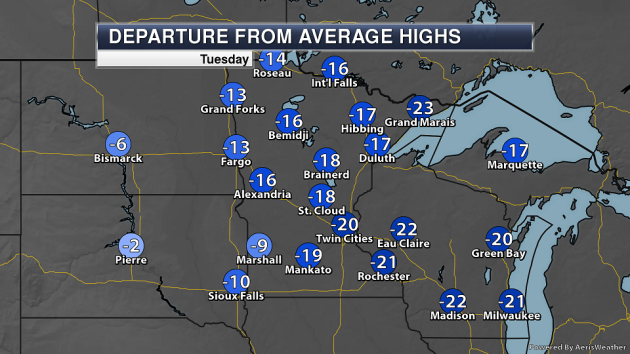 The exception to that is across western Minnesota, where they will be about 10 degrees below average. All we have to do is get past Tuesday, as highs will climb into the 40s Wednesday and Thursday in the Twin Cities. We do get another cool blast heading into the weekend before another warm-up occurs heading into Thanksgiving week. Some light snow accumulation may be possible later this week into early in the weekend as a system slides past the region. Otherwise, not much precipitation is expected over the next week. 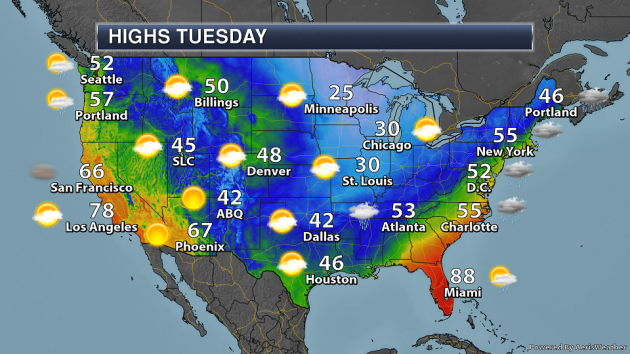 On Tuesday, a cold front moving east will bring showers and storms from the northern Gulf Coast to the Northeast, with snow likely across parts of the interior Northeast. Some lake effect snow is likely across the snow belts of the Great Lakes. Meanwhile, by the end of the day, rain and snow will move into the Pacific Northwest ahead of a cold front. 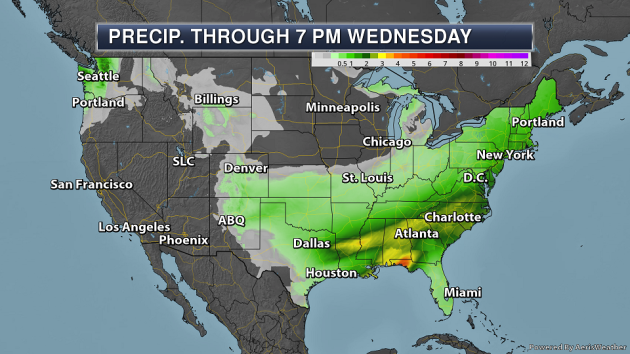 The heaviest rain through the middle of the week will be across parts of the Deep South to the Mid-Atlantic, where 3"+ of rain could fall. This could lead to flash flooding. Across parts of the Northeast, 6-10" of snow could fall Monday Night into Tuesday as a cold front moves through. Some lake enhanced snow is also expected to fall over the next couple days across the Great Lakes. Three large, destructive wildfires continue to burn in California this morning. The Camp Fire has burned 111,000 acres in Butte County and is 25% contained. 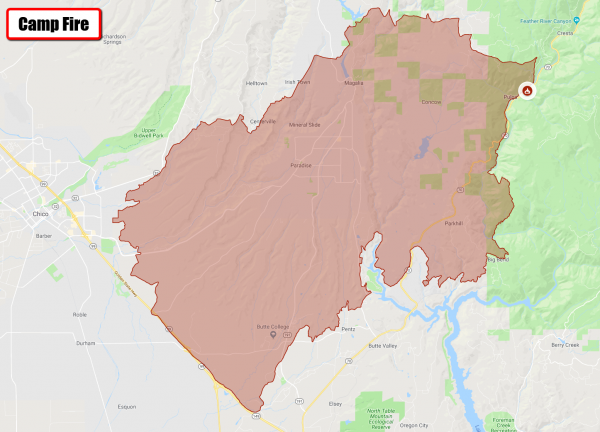 Over 6,700 structures have been destroyed by the Camp Fire, including 90% of Paradise, CA. This fire is now tied with the 1933 Griffith Park fire as the deadliest on record in California history. The Woolsey Fire in Los Angeles and Ventura Counties has burned 85,500 acres and was only 15% contained. The city of Calabasas was put under mandatory evacuations Sunday evening. The Hill Fire has burned 4,531 acres and is 75% contained. Strong Santa Ana winds will continue across Southern California over the next couple days, resulting in an extreme fire danger. These winds, along with low humidity values, would allow any ongoing fires or new fires that ignite to quickly spread. 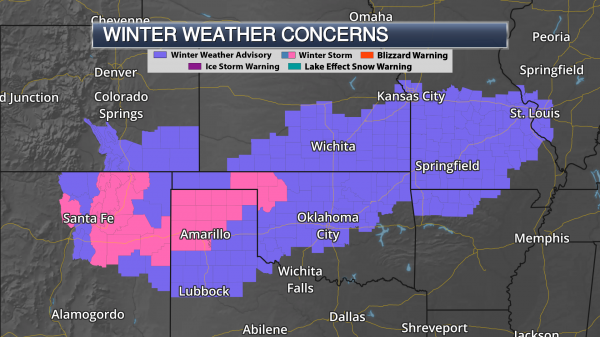 A winter storm is impacting parts of the southern and central Plains this morning, with snowfall totals of 7” already reported across parts of the Texas Panhandle. 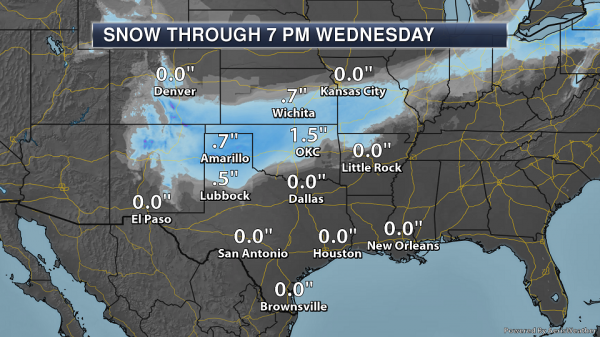 Additional snow totals of 1-4” will be possible today into tonight from Texas to Missouri. We also have our eye on the tropics, as a tropical wave located 200 miles east of the Leeward Islands could form into a tropical depression or storm over the next few days. This could impact the Leeward Islands, Puerto Rico, Hispaniola, and the southeastern Bahamas through the end of the week. Numerous Large Wildfires in California. 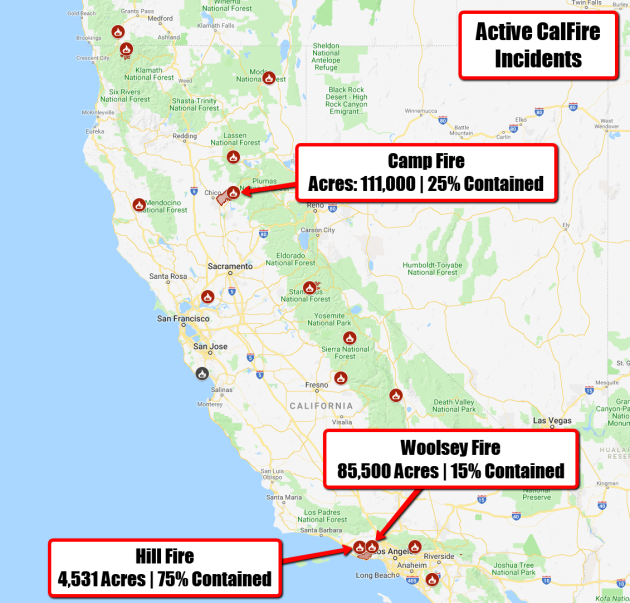 Multiple wildfires continue to burn in California with three major wildfires that are most concerning: the Camp Fire, the Woolsey Fire, and the Hill Fire. 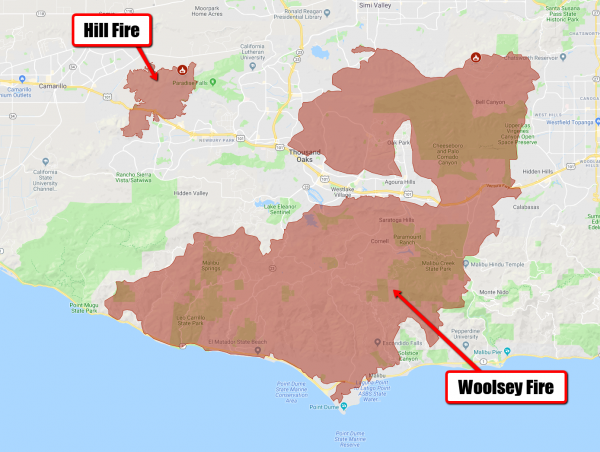 Woolsey And Hill Fire Update. As of Sunday evening, the Woolsey Fire has burned 85,500 acres and was only 15% contained. This fire has forced the evacuation of at least 75,000 homes and an estimated 265,000 people across Los Angeles and Ventura Counties. While the city of Calabasas was put under mandatory evacuations Sunday evening, some areas of Agoura Hills, Newbury Park, Thousand Oaks and Westlake Village were allowed to repopulate. The Hill Fire has burned 4,531 acres and is 75% contained. Mandatory evacuation orders remain in effect for the South Coast area and Point Mugu Naval Base. Fire Danger Today. 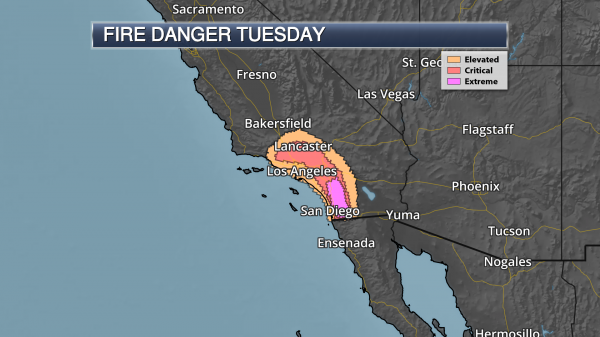 Extreme fire danger continues today across Southern California due to the ongoing Santa Ana wind event. Sustained winds of at least 20 mph will be possible, with gusts up to 70 mph in the most wind-prone areas. These winds, along with low humidity values and dry fuels, would allow any ongoing fires or new fires that ignite to quickly spread. The period of highest winds is expected in the morning to early afternoon hours. Fire Danger Tuesday. 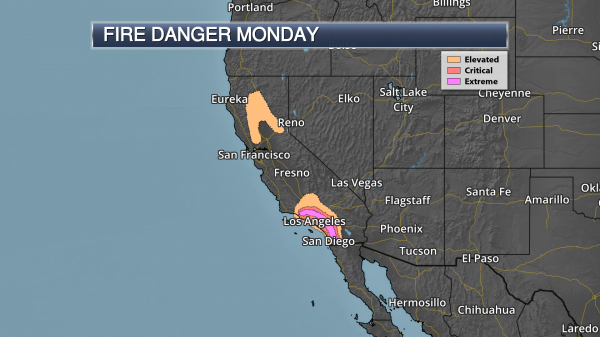 The extreme fire danger threat continues Tuesday from the San Jacinto and Santa Ana Mountains to the Mexico border, particularly during the first half of the day. Wind gusts of 40+ mph will continue to be possible during this time. Based off some pressure gradient forecasts, Tuesday could be the windiest day across southern California. The pressure gradient will gradually decrease later in the day; therefore winds should decrease somewhat during the afternoon and evening hours. Even with that occurring, fire growth due to the winds and low humidity will still be possible. 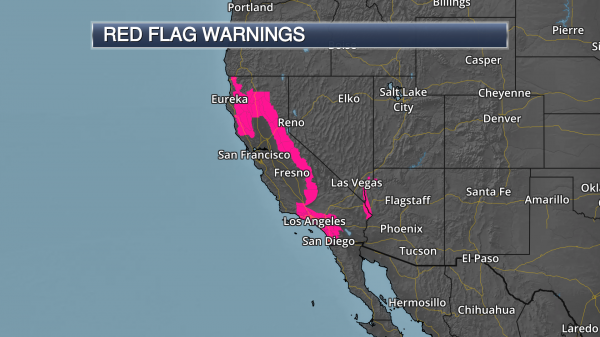 Red Flag Warnings. Due to the ongoing fire weather threat across the region, numerous Red Flag Warnings are in effect. In Northern California, most of these are in effect this morning, with warnings continuing through Tuesday across Southern California. High Wind Warnings. 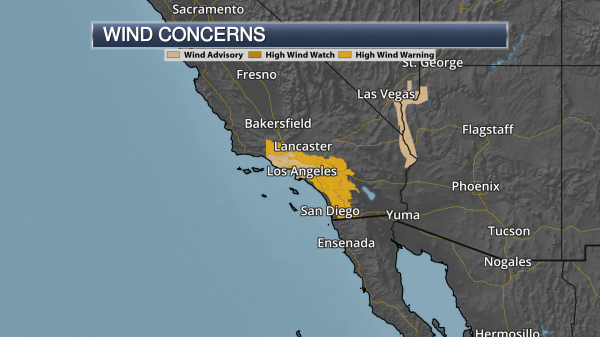 With wind gusts up to 70 mph possible in favored areas, especially through the morning and early afternoon hours, High Wind Warnings have been issued across Southern California through 5 PM Tuesday. Southern Snow Totals So Far. 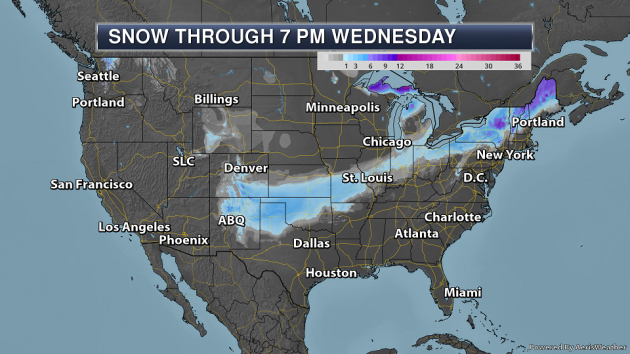 Heavy snow has fallen across parts of Colorado, New Mexico, and the panhandle of Texas. 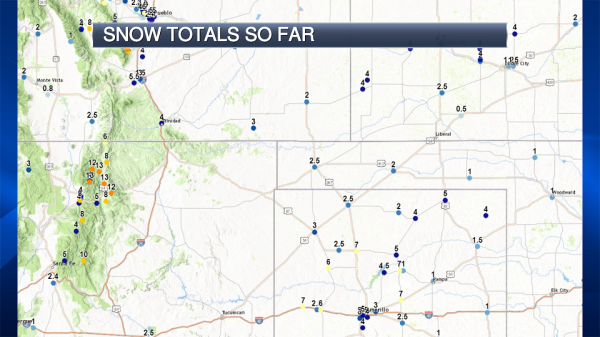 Some of the heaviest fell across the mountains of New Mexico and Colorado, with 13” falling in Eagle Nest and Red River Pass (NM), and up to about 10” on the west side of Colorado Springs, CO. In the panhandle of Texas, snow totals of 7” so far have been reported in Adrian, Dumas, Borger, and Panhandle, with 3-5” in Amarillo. Overnight there were reports of at least two jackknifed semis blocking Highway 287 between Dumas and Amarillo. Additional Snow Expected. A band of an additional 1-4” (with isolated higher amounts) will fall from New Mexico and Colorado to Missouri through tonight. This additional snow will have the potential to cause travel issues across the region. Eye On The Tropics. We also have our eye on the tropics over the next several days. A tropical wave located 200 miles east of the Leeward Islands could form into a tropical depression or storm over the next few days. 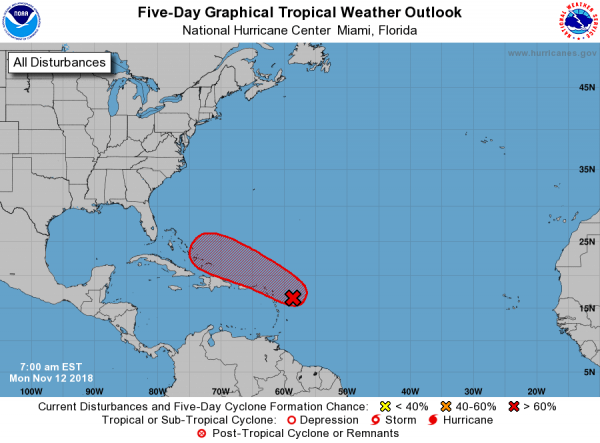 Right now the National Hurricane Center has odds of forming at 50% in the next two days and 90% over the next five days. This system – whether or not it forms – looks to pass near or north of the Leeward Islands, Puerto Rico, Hispaniola, and the southeastern Bahamas through the end of the week. Models do keep this system below hurricane strength before merging with a cold front late in the week and being pushed back out into the Atlantic. More from the Sacramento Bee: "Gov. Jerry Brown on Sunday said wildfires like the ones spanning the state today threaten “our whole way of life” and lend urgency to efforts that would slow the impacts of man-made climate change. “This is not the new normal,” he said, employing a phrase that state leaders have used to describe the past two deadly, prolonged California fire seasons. “This is the new abnormal, and this new abnormal will continue certainly in the next 10 to 15 years.” He spoke a day after President Donald Trump wrote a message on Twitter that seemed to blame California government for the 2017 and 2018 wildfires that wiped out parts of Santa Rosa, Redding and now Paradise. “There is no reason for these massive, deadly and costly forest fires in California except that forest management is so poor,” Trump wrote." More from Popular Science: "About 300,000 Americans are diagnosed annually with Lyme, with cases concentrated in the Northeast and upper Midwest, according to the Centers for Disease Control and Prevention. The incidence of the disease has doubled in the United States since 1991, according to the EPA. And it’s about to get much worse, thanks to climate change. “Warmer temperatures are making cold places suitable habitats for ticks, so new places are having Lyme disease cases, and endemic areas are having more cases than the average,” said Edson Severnini, assistant professor of economics and public policy at Carnegie Mellon University’s Heinz College, and co-author of a new study that predicts the incidence Lyme disease will rise around 21 percent by mid-century. Climate change already has amplified the range of invasive insects that devour crops, destroy homes, and spread disease. “Tick-borne diseases are an important public health concern and the incidence of these infections is increasing in the United States and worldwide,” said Igor Dumic, the study’s lead author and a researcher at the Mayo Clinic College of Medicine and Science who has treated numerous Lyme patients. “Lyme disease is a classic example of the link between environmental factors and the occurrence and spread of disease.”"
More from NBC News: "Imagine flooding a desert half the size of the Sahara. Using 238 trillion gallons of desalinated ocean water to do the job. Creating millions of 1-acre-square micro-reservoirs to grow enough algae to gobble up all of Earth’s climate-changing carbon dioxide. For an encore: How about spreading the water and fertilizer (the dead algae) to grow a vast new forest of oxygen-producing trees? A Silicon Valley venture capital firm, Y Combinator, unveiled the radical desert flooding plan as one of four “moonshot” scenarios that it hopes innovators will explore as potential remedies to catastrophic global warming." Cold Start To The Week - 40s Return Mid-Week!